We want to thank Brenda Forman for generously placing her collection of pop-up books on deposit with Special Collections. This exhibition is drawn almost exclusively from Dr. Forman's impressive collection of over 800 items. This exhibition was curated by Johanna Drucker, Robertson Professor of Media Studies. Graphic design for poster and banner by Josef Beery. Illustrations by Charles Peale. QTVR and Flash design elements designed and constructed by Will Rourk, Digital Media Lab, Robertson Media Center. Materials from the physical exhibit were digitized by staff in the Special Collections Digital Center using the center's Epson Expression 800 scanners, Kontron ProgRes model 3012 digital camera and PhotoPhase Plus digital camera. Images were enhanced for web display using Debabelizer 3.0 and Adobe Photoshop 5.0. The digital exhibit is optimized for viewing on a monitor that supports the display of 24-bit color. 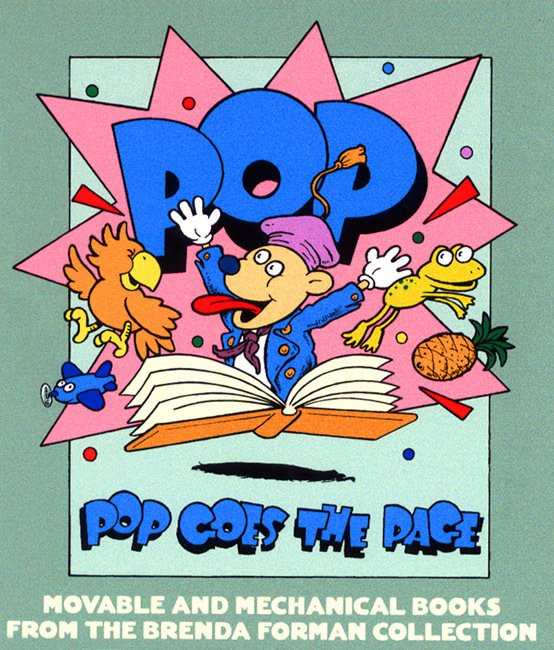 All banners for the digital version of "Pop Goes The Page" were designed by Paola A. Sanmiguel, Electronic Publications Coordinator, Communications & Publications Department, U.Va Library. The original site construction was managed by Felicia Johnson, Assistant Director, Special Collections Digital Center. The current website was built in Omeka by the Online Library Environment team in 2013. Special thanks to: Sara Lee Barnes, Carol Barton, Michael Chase-Levenson, Gayle Cooper, Katie Johnson, Ann Montanaro, John Riser, George Riser, Kathryn Schoefert, and Elizabeth Thompson.